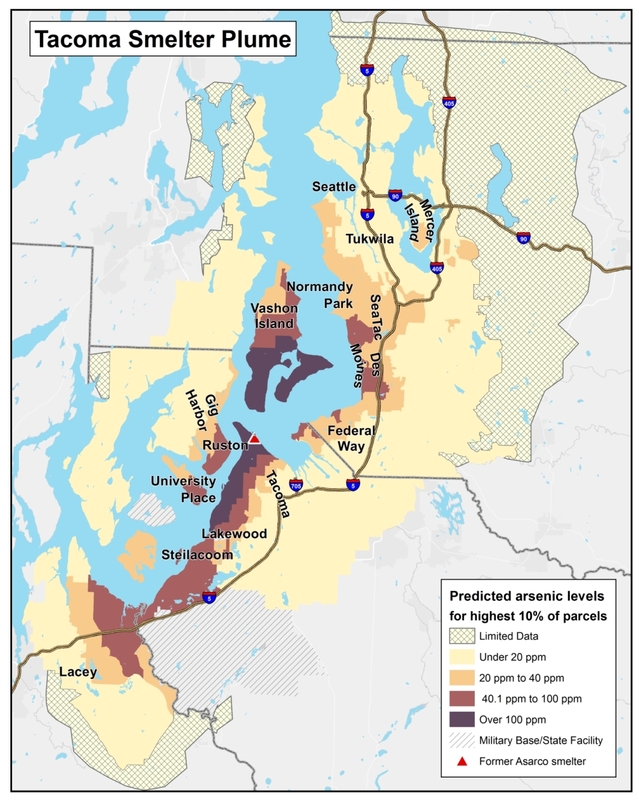 Did you know that if you live in the Tacoma Smelter Plume, which is throughout Pierce, King, and Thurston Counties, your dirt could contain Arsenic, Lead, and other Chemicals that can harm you and your children? Why is this important? Many of us love to play in the yard, but kids are more likely to come in direct contact with dirt. Children under the age of 6 are at the greatest risk from this contamination. Others at risk include gardeners, landscapers, and construction workers. Essentially, anyone that comes in contact with impacted soil. The good news is that by following some “Healthy Actions” you can help protect your family from chemicals found in dirt. Is your property contaminated? If you don’t know, do you want to have your property sampled? Find out more about your property and if it qualifies for free sampling or cleanup HERE! The Tacoma Smelter Plume is a 1,000-square mile area in King, Pierce, and Thurston Counties impacted by arsenic and lead in the soil from an industrial copper smelter in Ruston, WA. Arsenic and Lead in soil can cause adverse health effects with long-term exposure. We offer free soil sampling and educational materials to homeowners in the plume. Areas closest to the smelter may qualify for removal of contaminated soils.